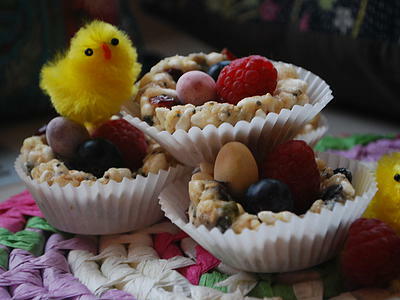 The one thing most people love making with their children is little chocolate nests filled with chocolate eggs – especially around Easter time. We have managed to create something that will be just as much fun to make with your children, taste wonderful and is just that little bit healthier! We’ve included brown rice, which helps ensure a slower release of energy, as well as providing useful fibre, and almonds which are a great source of protein. We’ve also included some chia and sunflower seeds, which contain Omega 6 fats that are good for healthy skin. Pop the almond butter and honey into a small pan and heat for a couple of minutes. It will gradually soften and form a thick paste. Next add the dried fruit, seeds and rice puffs. Mix all together with a wooden spoon. Next, checking that it's not too hot, take small ball-sized handfuls and either in the palm of your hand or using a cupcake case. Firm the paste together and mould it into little nest shapes. You should be able to create a nice little hollow so don't give up if it starts off rather crumbly as it will come together. The cupcake case itself will lose its shape so I often place them in another fresh case for effect (so each nest sits in 2 cases). 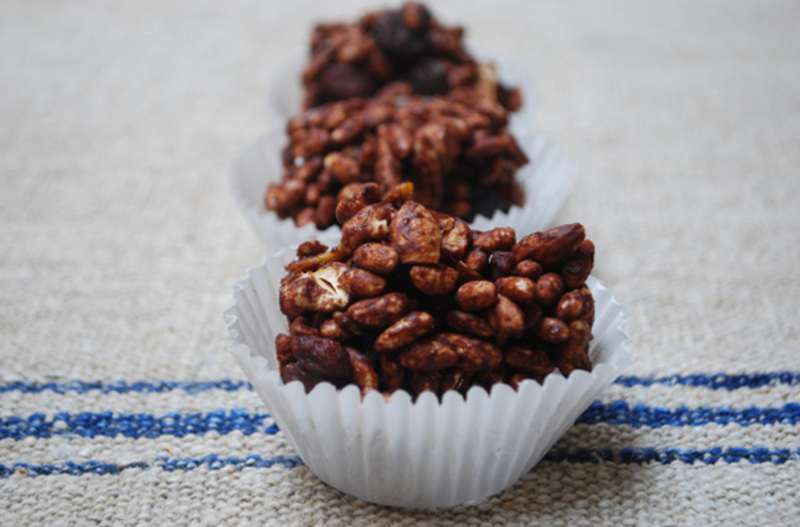 These wonderful little snacks can be kept in the freezer so last ages and are always to hand! They make the perfect Easter time treat. 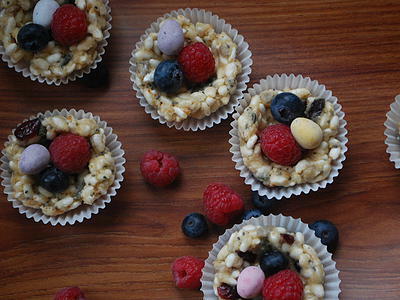 We’ve got lots of sweet treat ideas including Healthy Cupcakes and No Sugar Flapjacks.